Country star Keith Urban poses with South Jersey substitute teacher Ruth Reed, who paid for Urban's snacks at a Jersey Wawa last week. 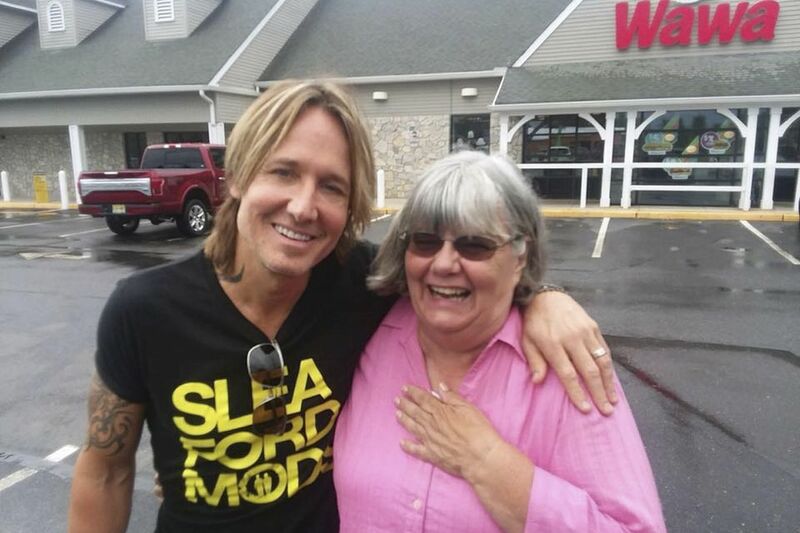 Country music star Keith Urban's money is no good at Wawa, at least when one South Jersey substitute teacher is around. Urban stopped at a Wawa in Medford on Friday ahead of his scheduled performance at Camden's BB&T Pavilion, where a local woman stepped up to pay for his snacks, New Jersey 101.5 FM reports. The generous customer was Ruth Reed, a substitute teacher in South Jersey who happened to be in the store at the same time as Urban. As Olivia Prouse, a former student of Reed's, wrote on Twitter, Reed thought Urban was "down on his luck and couldn't pay for his Wawa snacks so she bought them for him." "What an angel," Prouse added. >> READ MORE: Is 'Woke Country' a thing? Is there a #MeToo moment happening in country music? >> READ MORE: Can Rolling Stone ever be cool again? Reed posted a Facebook comment explaining what happened, NorthJersey.com reports, writing that she has made resolutions over the last few years to help out fellow Wawa customers. At the time, she didn't know who Urban was, and jumped at the chance to pay for his items after seeing he was short a few dollars. "He thanked me and asked my name," Reed wrote. "I asked him his and told me it was Keith. I said that he did look like Keith Urban and he said he was. I didn't believe him." After asking his bodyguard to confirm Urban's identity, Reed wrote that she "realized what an idiot I was." Still, she managed to snap a photo with Urban. The country star played Camden's BB&T Pavilion on Friday night, which he said he almost called "the PB&J Center" in a video following the performance. "That wouldn't have been good," Urban said. "Tasty, though."